Paul Robin Krugman (born February 28, 1953) is an American New Keynesian economist, Professor of Economics and International Affairs at the Woodrow Wilson School of Public and International Affairs at Princeton University, Centenary Professor at the London School of Economics, and an op-ed columnist for The New York Times. Do some homework to find out what these people really want. I’m not talking about deeply hidden motives; usually the true goal is in the public domain. If there is one single area of economics in which path dependence is unmistakable, it is in economic geography – the location of production in space. But the honest truth is that what drives me as an economist is that economics is fun. I think I understand why so many people think that economics is a boring subject, but they are wrong. On the contrary, there is hardly anything I know that is as exciting as finding that the great events that move history, the forces that determine the destiny of empires and the fate of kings, can sometimes be explained, predicted, or even controlled by a few symbols on a printed page. We all want power, we all want success, but the ultimate reward is the simple joy of understanding. If economists ruled the world, there would be no need for a World Trade Organization. The economist's case for free trade is essentially a unilateral case- that is, it says that a country serves its own interests by pursuing free trade regardless of what other countries may do. It is a bit funny, but also quite sad: Those who preach the doctrine of global glut are tilting at windmills, when there are some real monsters out there that need slaying. The idea of comparative advantage—with its implication that trade between two nations normally raises the real incomes of both—is, like evolution via natural selection, a concept that seems simple and compelling to those who understand it. Yet anyone who becomes involved in discussions of international trade beyond the narrow circle of academic economists quickly realizes that it must be, in some sense, a very difficult concept indeed. Now I’m not saying that Keynes was right about everything, that we should treat The General Theory as a sort of secular bible - the way that Marxists treat Das Kapital. But the essential truth of Keynes’s big idea - that even the most productive economy can fail if consumers and investors spend too little, that the pursuit of sound money and balanced budgets is sometimes (not always!) folly rather than wisdom - is as evident in today’s world as it was in the 1930s. And in these dangerous days, we ignore or reject that idea at the world economy’s peril. So the story of the baby-sitting co-op is not a mere amusement. If people would only take it seriously—if they could only understand that when great economic issues are at stake, whimsical parables are not a waste of time but the key to enlightenment—it is a story that could save the world. Here, then, is a revised version of Marshall's rules: (1) Figure out what you think about an issue, working back and forth among verbal intuition, evidence, and as much math as you need. (2) Stay with it till you are done. (3) Publish the intuition, the math, and the evidence - all three - in an economics journal. (4) But also try to find a way of expressing the idea without the formal apparatus. (5) If you can, publish that where it can do the world some good. In short, the success of macroeconomic activism, in both theory and practice, has made it possible for free market microeconomics to survive--again both in theory and in practice. The hangover theory, then, turns out to be intellectually incoherent; nobody has managed to explain why bad investments in the past require the unemployment of good workers in the present. Yet the theory has powerful emotional appeal. Usually that appeal is strongest for conservatives, who can't stand the thought that positive action by governments (let alone—horrors!—printing money) can ever be a good idea. Some libertarians extol the Austrian theory, not because they have really thought that theory through, but because they feel the need for some prestigious alternative to the perceived statist implications of Keynesianism. And some people probably are attracted to Austrianism because they imagine that it devalues the intellectual pretensions of economics professors. But moderates and liberals are not immune to the theory's seductive charms—especially when it gives them a chance to lecture others on their failings. The serious lesson of the antics in Argentina, then, is that the big issues of monetary economics--fixed vs. flexible exchange rates, whether countries should have independent currencies at all--are still wide open. It's an eternal controversy, and not even the pope can resolve it. The whole subject of the liquidity trap has a sort of Alice-through-the-looking glass quality. Virtues like saving, or a central bank known to be strongly committed to price stability, become vices; to get out of the trap a country must loosen its belt, persuade its citizens to forget about the future, and convince the private sector that the government and central bank aren’t as serious and austere as they seem. There is no economic policy. That's really important to say. The general modus operandi of the Bushies is that they don't make policies to deal with problems. They use problems to justify things they wanted to do anyway. So there is no policy to deal with the lack of jobs. There really isn't even a policy to deal with terrorism. It's all about how can we spin what's happening out there to do what we want to do. ...Exxon Mobil is a worse environmental villain than other big oil companies...Exxon, headed by Mr. Raymond, chose a different course of action: it decided to fight the science....And that's just what Exxon Mobil has done: lavish grants have supported a sort of alternative intellectual universe of global warming skeptics....the fact is that whatever small chance there was of action to limit global warming became even smaller because ExxonMobil chose to protect its profits by trashing good science. Krugman, Paul (April 17, 2006). "Enemy of the Planet". The New York Times. Retrieved on December 24, 2018. It’s a tribute to the importance of Friedman’s work that questions about his legacy bear so directly on contemporary policy issues. But for that reason it’s also important not to engage in hagiography. Friedman was a great economist, but like every other great economist in history, he was also wrong about some important things. Whether the influence of increasing returns on trade and geography is rising or falling, one thing is clear: much was learned from the intellectual revolution that brought increasing returns into the heart of how we think about the world economy. It wasn't just that economists could make sense of previously puzzling data, we found ourselves able to see things that had previously been in an intellectual blind spot. Many people contributed to this process of enlightenment; I'm proud to have been a part of the journey. So let’s bid a not at all fond farewell to the Big Zero — the decade in which we achieved nothing and learned nothing. I know that when I look at today’s Mexicans and Central Americans, they seem to me fundamentally the same as my grandparents seeking a better life in America. On the other side, however, open immigration can’t coexist with a strong social safety net; if you’re going to assure health care and a decent income to everyone, you can’t make that offer global. So Democrats have mixed feelings about immigration; in fact, it’s an agonizing issue. … politics determine who has the power, not who has the truth. It’s a great honour to be asked to give this talk, especially because I’m arguably not qualified to do so. I am, after all, not a Keynes scholar, nor any kind of serious intellectual historian. Nor have I spent most of my career doing macroeconomics. Until the late 1990s my contributions to that field were limited to international issues; although I kept up with macro research, I avoided getting into the frontline theoretical and empirical disputes. If we discovered that, you know, space aliens were planning to attack and we needed a massive buildup to counter the space alien threat and really inflation and budget deficits took secondary place to that, this slump would be over in 18 months. … There was a Twilight Zone episode like this in which scientists fake an alien threat in order to achieve world peace. Well, this time, we don't need it, we need it in order to get some fiscal stimulus. ...and Newt [Gingrich] — although somebody said "he’s a stupid man’s idea of what a smart person sounds like," but he is more plausible than the other guys that they’ve been pushing up. International trade in goods and services has expanded steadily over the past six decades thanks to declines in shipping and communication costs, globally negotiated reductions in government trade barriers, the widespread outsourcing of production activities, and a greater awareness of foreign cultures and products. New and better communications technologies, notably the Internet, have revolutionized the way people in all countries obtain and exchange information. More than four years after the financial crisis began, the world's major advanced economies remain deeply depressed, in a scene all too reminiscent of the 1930s. And the reason is simple: we are relying on the same ideas that governed policy in the 1930s. These ideas, long since disproved, involve profound errors both about the causes of the crisis, its nature, and the appropriate response. This is a serious analysis of a ridiculous subject, which is of course the opposite of what is usual in economics. When the economy is in a depression, scarcity ceases to rule. Productive resources sit idle, so that it is possible to have more of some things without having less of others; free lunches are all around. As a result, all the usual rules of economics are stood on their head; we enter a looking-glass world in which virtue is vice and prudence is folly. Thrift hurts our future prospects; sound money makes us poorer. Moreover, that's the kind of world we have been living in for the past several years, which means that it is a kind of world that students should understand. […] Depression economics is marked by paradoxes, in which seemingly virtuous actions have perverse, harmful effects. Two paradoxes in particular stand out: the paradox of thrift, in which the attempt to save more actually leads to the nation as a whole saving less, and the less-well-known paradox of flexibility, in which the willingness of workers to protect their jobs by accepting lower wages actually reduces total employment. […] In times of depression, the rules are different. Conventionally sound policy – balanced budgets, a firm commitment to price stability – helps to keep the economy depressed. Once again, this is not normal. Most of the time we are not in a depression. But sometimes we are – and 2013, when this chapter was written, was one of those times. “Depressions are Different”, in Robert M. Solow, ed. Economics for the Curious: Inside the Minds of 12 Nobel Laureates. 2014. I do not think this is a permanent condition. The craziness comes more from cultural ethnic issues than anything else, because you have a… A lot of the real craziness come from, if you like, from rural White Americans who feel that they’re losing their country, they’re losing ownership of the country. And they are right — we are becoming more diverse, more multicultural. And in the end, they are they…they…they are not the future. In the end, the power they still have will go away. But it’s a very difficult time until then. So the future is Mayor Deblasio of New York, but Ted Cruz is still out there with the ability to do a lot of damage. Economics is harder than physics; luckily it is not quite as hard as sociology. Why is economics such a hard subject? Part of the answer has to do with complexity. The economy cannot be put in a box. [...] Another reason economics is hard is that the critical sociologist is right: it involves human beings, who do not behave in simple, mechanical ways. As the example of Ronald Reagan shows, real political success comes not simply from appealing to the interests that people currently perceive but from finding ways to redefine their perceived interests, to harness their discontent in favor of changes that you can lead. Where do ideas about economics come from? They come, of course from economists—where by an "economist" I mean someone who thinks and writes regularly about economic issues. But not all economists are alike, and in fact the genus includes two radically distinct species: The professors and the policy entrepreneurs. The usual and basic Keynesian answer to recessions is a monetary expansion. But Keynes worried that even this might sometimes not be enough, particularly if a recession had been allowed to get out of hand and become a true depression. Once the economy is deeply depressed, households and especially firms may be unwilling to increase spending no matter how much cash they have, they may simply add any monetary expansion to their board. Such a situation, in which monetary policy has become ineffective, has come to be known as a "liquidity trap"; Keynes believed that the British and American economies had entered such a trap by the mid-1930s, and some economists believed that the United States was on the edge of such a tap in 1992. The Keynesian answer to a liquidity trap is for the government to do what the private sector will not: spend. When monetary expansion is ineffective, fiscal expansion—such as public works programs financed by borrowing—must take its place. Such a fiscal expansion can break the vicious circle of low spending and low incomes, "priming the pump: and getting the economy moving again. But remember that this is not by any means an all-purpose policy recommendation; it is essentially a strategy of desperation, a dangerous drug to be prescribed only when the usual over-the-counter remedy of monetary policy has failed. Like any major intellectual contribution, Keynes's ideas were bitterly criticized. To many people it seems obvious that massive economic slumps must have deep roots. To them, Keynes's argument that they are essentially no more than a problem of mixed signals, which can be cured by printing a bit more money, seems unbelievable. The new trade theory picture of the world looks something like this: Each country has, at any given time, a set of broad resources—land, skilled labor, capital, climate, general technological competence. These resources define up to a point the industries in which the country can hope to be competitive on world markets. [...] But a country's resources do not fully determine what it produces, because the detailed pattern of advantage reflects the self-reinforcing virtuous circles, set in motion by the vagaries of history. It's tempting to give up—either to retreat to the ivory tower, or to start to play the policy entrepreneur game. After all, what is the use of sophisticated policy thinking or careful examination of the facts if simplistic ideas win every time? One answer is simply that it would be wrong to give up. If the people with good ideas do not fight for them, they have no right to complain about the outcome. But good ideas will still often lose to convenient nonsense. When that happens, every serious economist is ultimately sustained by a faith that the right ideas will eventually prevail. Economists, like everyone, have their political biases, but these are by no means as strong an influence on what they are willing to consider as you might think. For example, one might have thought that strongly liberal economists like, say, James Tobin would be at least mildly sympathetic to the views of radical economists who draw their inspiration from Marx, or of heterodox economic thinkers like Galbraith. After all, in such fields as history and sociology the Marxist or post-Marxist left has long received a respectful hearing. And yet you don't find this happening: liberal economists are almost as quick as their conservative colleagues to condemn heterodox leftist ideas as foolish it was the liberal Robert Solow, not Milton Friedman, who defended orthodoxy in the bitter "capital controversy" with British radicals. The history of economic geography of the study of the location of economic activity is more like the story of geological thought about the shapes and location of continents and mountain ranges. Economists can often be remarkably obtuse, failing to see things that are right in front of them. But sometimes a bit of obtuseness is not entirely a bad thing. Many of those who reject the idea of economic models are ill-informed or even (perhaps unconsciously) intellectually dishonest. A temporary evolution of ignorance, a period when our insistence on looking in certain directions leaves us unable to see what is right under our noses, may be the price of progress, an inevitable part of what happens when we try to make sense of the world's complexity. Whose fault is the replacement of serious discussion of world trade by what I have come to think of as "pop internationalism"? To some extent, of course, it is the result of basic human instincts: intellectual laziness, even among those who would be seen as wise and deep, will always be a powerful force. To some extent it also reflects the decline in the influence of economists in general: the high prestige of the profession a generation ago had much to do with the presumed effectiveness of Keynesian macroeconomic policies, and has suffered greatly as macroeconomics has dissolved into squabbling factions. And one should not ignore the role of editors, who often prefer what pop internationalists have to say to the disturbingly difficult ideas of people who know how to read national accounts or understand that the trade balance is also the difference between savings and investment. Indeed, some important editors, like James Fallows at The Atlantic or Robert Kuttner at The American Prospect are pop internationalists themselves; they deliberately use their magazines as platforms for what amounts to an anti-intellectual crusade. The idea that a country's economic fortunes are largely determined by its success on world markets is a hypothesis, not a necessary truth; and as a practical, empirical matter, that hypothesis is flatly wrong. That is, it is simply not the case that the world's leading nations are to any important degree in economic competition with each other, or that any of their major economic problems can be attributed to failures to compete on world markets. This article makes three points. First, it argues that concerns about competitiveness are, as an empirical matter, almost completely unfounded. Second, it tries to explain why defining the economic problem as one of international competition is nonetheless so attractive to so many people. Finally, it argues that the obsession with competitiveness is not only wrong but dangerous, skewing domestic policies and threatening the international economic system. First, most of the speculation about the superiority of the communist system - including the popular view that Western economies could painlessly accelerate their own growth by borrowing some aspects of that system - was off base. Rapid Soviet economic growth was based entirely on one attribute: the willingness to save, to sacrifice current consumption for the sake of future production. The communist example offered no hint of a free lunch. Second, the economic analysis of communist countries' growth implied some future limits to their industrial expansion - in other words, implied that a naive projection of their past growth rates into the future was likely to greatly overstate their real prospects. Economic growth that is based on expansion of inputs, rather than on growth in output per unit of input, is inevitably subject to diminishing returns. It was simply not possible for the Soviet economies to sustain the rates of growth of labor force participation, average education levels, and above all the physical capital stock that had prevailed in previous years. Communist growth would predictably slow down, perhaps drastically. If growth in East Asia is indeed running into diminishing returns, however, the conventional wisdom about an Asian-centered world economy needs some rethinking. That's a hard answer to accept, especially for those American policy intellectuals who recoil from the dreary task of reducing deficits and raising the national savings rate. But economics is not a dismal science because the economists like it that way; it is because in the end we must submit to the tyranny not just of the numbers, but of the logic they express. In this book I try to show how models of self-organization can be applied to many economic phenomena - how the principle of "order from instability," which explains the growth of hurricanes and embryos, can also explain the formation of cities and business cycles; how the principle of "order from random growth" can explain the strangely simple rules that describe the sizes of earth quakes, meteorites, and metropolitan areas. I believe that the ideas of self-organization theory can add substantially to our understanding of the economy; whatever their ultimate usefulness, these ideas are very exciting, and playing around with them is tremendous fun. The world is full of self-organizing systems, systems that form structures not merely in response to inputs from outside but also, indeed primarily, in response to their own internal logic. Global weather is a self-organizing system; so, surely, is the global economy. There are three kinds of writing in economics: Greek-letter, up-and-down, and airport. Greek-letter writing formal, theoretical, mathematical is how professors communicate. Like any academic field, economics has its fair share of hacks and phonies, who use complicated language to hide the banality of their ideas; it also contains profound thinkers, who use the specialized language of the discipline as an efficient way to express deep insights. [...] Up-and-down economics is what one encounters on the business pages of newspapers, or for that matter on TV. It is preoccupied with the latest news and the latest numbers, hence its name. [...] Finally, airport economics is the language of economics bestsellers. These books are most prominently displayed at airport bookstores, where the delayed business traveler is likely to buy them. Most of these books predict disaster: a new great depression, the evisceration of our economy by Japanese multinationals, the collapse of our money. A minority have the opposite view, a boundless optimism: new technology or supply-side economics is about to lead us into an era of unprecedented economic progress. Whether pessimistic or optimistic, airport economics is usually fun, rarely well informed, and never serious. Productivity isn't everything, but in the long run it is almost everything. A country's ability to improve its standard of living over time depends almost entirely on its ability to raise its output per worker. The appeal to the intellectually insecure is also more important than it might seem. Because economics touches so much of life, everyone wants to have an opinion. Yet the kind of economics covered in the textbooks is a technical subject that many people find hard to follow. How reassuring, then, to be told that it is all irrelevant -- that all you really need to know are a few simple ideas! Quite a few supply-siders have created for themselves a wonderful alternative intellectual history in which John Maynard Keynes was a fraud, Paul Samuelson and even Milton Friedman are fools, and the true line of deep economic thought runs from Adam Smith through obscure turn-of-the-century Austrians straight to them. The legend of King Midas has been generally misunderstood. Most people think the curse that turned everything the old miser touched into gold, leaving him unable to eat or drink, was a lesson in the perils of avarice. But Midas’s true sin was his failure to understand monetary economics. What the gods were really telling him is that gold is just a metal. If it sometimes seems to be more, that is only because society has found it convenient to use gold as a medium of exchange—a bridge between other, truly desirable, objects. There are other possible mediums of exchange, and it is silly to imagine that this pretty, but only moderately useful, substance has some irreplaceable significance. Will the tax cut destroy America’s prosperity? Probably not. As Adam Smith observed, there’s a deal of ruin in a nation. We have a huge, resilient economy that can survive and recover from even quite bad government policies. Yet while the tax cut may not be a matter of economic life or death, it is a very serious issue. For one thing, like it or not, the tax cut has become the central political issue in the United States right now. Conservatives who want to reshape America view passage of a large tax cut as a first step toward realizing their vision. For that reason, those who do not share this vision feel, rightly, that they must oppose the plan. To be a progressive, then, means being a partisan—at least for now. The only way a progressive agenda can be enacted is if Democrats have both the presidency and a large enough majority in Congress to overcome Republican opposition. And achieving that kind of political preponderance will require leadership that makes opponents of the progressive agenda pay a political price for their obstructionism—leadership that, like FDR, welcomes the hatred of the interest groups trying to prevent us from making our society better. Most economists, to the extent that they think about the subject at all, regard the Great Depression of the 1930s as a gratuitous, unnecessary tragedy. The kind of economic trouble that Asia experienced a decade ago, and that we're all experiencing now, is precisely the sort of thing we thought we had learned to prevent. In the bad old days big, advanced economies with stable governments-like Britain in the 1920s-might have had no answer to prolonged periods of stagnation and deflation; but between John Maynard Keynes and Milton Friedman, we thought we knew enough to keep that from happening again. At the time, I thought of it this way: it was as if bacteria that used to cause deadly plagues, but had long been considered conquered by modem medicine, had reemerged in a form resistant to all the standard antibiotics. Here's what I wrote in the introduction to the first edition: "So far only a limited number of people have actually fallen prey to the newly incurable strains; but even those of us who have so far been lucky would be foolish not to seek new cures, new prophylactic regimens, whatever it takes, lest we tum out to be the next victims." Well, we were foolish. And now the plague is upon us. We will not achieve the understanding we need, however, unless we are willing to think clearly about our problems and to follow those thoughts wherever they lead. Some people say that our economic problems are structural, with no quick cure available; but I believe that the only important structural obstacles to world prosperity are the obsolete doctrines that clutter the minds of men. Many of the stories economists tell take the form of models—for whatever else they are, economic models are stories about how the world works. As is often the case with major disputes in economics, the argument over fiscal policy went on for years, with some critics of fiscal policy still defending their position when this book went to press. It seems fair, however, to say that among economists a more or less Keynesian view of the effects of fiscal policy came to prevail. Careful statistical studies at the International Monetary Fund and else where showed that austerity policies have historically been followed by contraction, not expansion. Recent experience, in which countries like Spain and Greece that were forced into severe austerity also experienced severe slumps, seemed to confirm that observation. Furthermore, it was clear that those who had predicted a sharp rise in U.S. interest rates due to budget deficits, leading to conventional crowding out, had been wrong: U.S. long-term interest rates remained near record lows even during the years from 2009 to 2012, when the government ran very large deficits. To fight this recession the Fed needs more than a snapback; it needs soaring household spending to offset moribund business investment. And to do that, as Paul McCulley of Pimco put it, Alan Greenspan needs to create a housing bubble to replace the Nasdaq bubble. Judging by Mr. Greenspan's remarkably cheerful recent testimony, he still thinks he can pull that off. But the Fed chairman's crystal ball has been cloudy lately; remember how he urged Congress to cut taxes to head off the risk of excessive budget surpluses? And a sober look at recent data is not encouraging. It should be noted that Krugman was being sarcastic; two weeks later, he wrote an article warning about the dangers of a housing bubble. I do not think that word “compromise” means what Mr. Ryan thinks it means. Above all, he failed to offer the one thing the White House won’t, can’t bend on: an end to extortion over the debt ceiling. Yet even this ludicrously unbalanced offer was too much for conservative activists, who lambasted Mr. Ryan for basically leaving health reform intact. Does this mean that we’re going to hit the debt ceiling? Quite possibly; nobody really knows, but careful observers are giving no better than even odds that any kind of deal will be reached before the money runs out. Beyond that, however, our current state of dysfunction looks like a chronic condition, not a one-time event. Even if the debt ceiling is raised enough to avoid immediate default, even if the government shutdown is somehow brought to an end, it will only be a temporary reprieve. Conservative activists are simply not willing to give up on the idea of ruling through extortion, and the Obama administration has decided, wisely, that it will not give in to extortion. So how does this end? How does America become governable again? Paul Krugman (October 13, 2013). "The Dixiecrat Solution". New York Times. Retrieved on October 15, 2013. Things could have been even worse. This week, we managed to avoid driving off a cliff. But we’re still on the road to nowhere. Paul Krugman (October 18, 2013). "The Damage Done". New York Times. Retrieved on October 18, 2013. Many liberals have changed their views in response to new evidence. It’s an interesting experience; conservatives should try it some time. Paul Krugman (17 July 2015). "Liberals and Wages". New York Times. Retrieved on 17 July 2015. Holding people accountable for their past is O.K., but imposing a standard of purity, in which any compromise or misstep makes you the moral equivalent of the bad guys, isn’t. Abraham Lincoln didn’t meet that standard; neither did F.D.R. Nor, for that matter, has Bernie Sanders (think guns). Prediction in the aftermath of Donald Trump's presidential election victory. Markets recovered the following day. The fact is that Democrats have already been pursuing policies that are much better for the white working class than anything the other party has to offer. Yet this has brought no political reward. Nobody can credibly promise to bring the old jobs back; what you can promise — and Mrs. Clinton did — are things like guaranteed health care and higher minimum wages. But working-class whites overwhelmingly voted for politicians who promise to destroy those gains. You can’t explain the votes of places like Clay County as a response to disagreements about trade policy. The only way to make sense of what happened is to see the vote as an expression of, well, identity politics — some combination of white resentment at what voters see as favoritism toward nonwhites (even though it isn’t) and anger on the part of the less educated at liberal elites whom they imagine look down on them. Democrats have to figure out why the white working class just voted overwhelmingly against its own economic interests, not pretend that a bit more populism would solve the problem. If Keynes was Luther, Friedman was Ignatius of Loyola, founder of the Jesuits. And like the Jesuits, Friedman’s followers have acted as a sort of disciplined army of the faithful, spearheading a broad, but incomplete, rollback of Keynesian heresy. By the century’s end, classical economics had regained much though by no means all of its former dominion, and Friedman deserves much of the credit. Keynesian theory initially prevailed because it did a far better job than classical orthodoxy of making sense of the world around us, and Friedman’s critique of Keynes became so influential largely because he correctly identified Keynesianism’s weak points. And just to be clear: although this essay argues that Friedman was wrong on some issues, and sometimes seemed less than honest with his readers, I regard him as a great economist and a great man. Keynes didn’t make an all-out assault on Economic Man, but he often resorted to plausible psychological theorizing rather than careful analysis of what a rational decision-maker would do. Business decisions were driven by “animal spirits,” consumer decisions by a psychological tendency to spend some but not all of any increase in income, wage settlements by a sense of fairness, and so on. But was it really a good idea to diminish the role of Economic Man that much? No, said Friedman, who argued in his 1953 essay “The Methodology of Positive Economics” that economic theories should be judged not by their psychological realism but by their ability to predict behavior. And Friedman’s two greatest triumphs as an economic theorist came from applying the hypothesis of rational behavior to questions other economists had thought beyond its reach. One interesting footnote: although Friedman made great strides in macroeconomics by applying the concept of individual rationality, he also knew where to stop. In the 1970s, some economists pushed Friedman’s analysis of inflation even further, arguing that there is no usable trade-off between inflation and unemployment even in the short run, because people will anticipate government actions and build that anticipation, as well as past experience, into their price-setting and wage-bargaining. This doctrine, known as “rational expectations,” swept through much of academic economics. But Friedman never went there. In effect, Japan in the Nineties offered a fresh opportunity to test the views of Friedman and Keynes regarding the effectiveness of monetary policy in depression conditions. And the results clearly supported Keynes’s pessimism rather than Friedman’s optimism. What’s odd about Friedman’s absolutism on the virtues of markets and the vices of government is that in his work as an economist’s economist he was actually a model of restraint. As I pointed out earlier, he made great contributions to economic theory by emphasizing the role of individual rationality—but unlike some of his colleagues, he knew where to stop. Why didn’t he exhibit the same restraint in his role as a public intellectual? In the long run, great men are remembered for their strengths, not their weaknesses, and Milton Friedman was a very great man indeed—a man of intellectual courage who was one of the most important economic thinkers of all time, and possibly the most brilliant communicator of economic ideas to the general public that ever lived. But there’s a good case for arguing that Friedmanism, in the end, went too far, both as a doctrine and in its practical applications. When Friedman was beginning his career as a public intellectual, the times were ripe for a counterreformation against Keynesianism and all that went with it. But what the world needs now, I’d argue, is a counter-counterreformation. Equally important, the financial industry’s political power has not gone away. Banks have waged a fierce campaign against what many expected to be an easily passed reform proposal, the creation of a new agency to protect financial consumers. Despite the steady drumbeat of scandalous revelations—most recently, the discovery that Goldman Sachs helped Greece cook its books, while Lehman cooked its own books—top financial executives continue to have ready access to the corridors of power. And as many have noted, President Obama’s chief economic and financial officials are men closely associated with Clinton-era deregulation and financial triumphalism; they may have revised their views but the continuity remains striking. In that sense, this time really is different: while the first great global financial crisis was followed by major reforms, it’s not clear that anything comparable will happen after the second. And history tells us what will happen if those reforms don’t take place. There will be a resurgence of financial folly, which always flourishes given a chance. And the consequence of that folly will be more and quite possibly worse crises in the years to come. We’re living in a Dark Age of macroeconomics. Remember, what defined the Dark Ages wasn’t the fact that they were primitive — the Bronze Age was primitive, too. What made the Dark Ages dark was the fact that so much knowledge had been lost, that so much known to the Greeks and Romans had been forgotten by the barbarian kingdoms that followed. We’re now in the seventh year of a slump brought on by Wall Street excess; the wizardly job of “allocating the economy’s investment resources” consisted, we now know, largely of funneling money into a real estate bubble. It has been obvious for quite a while that Sanders — not just his supporters, not even just his surrogates, but the candidate himself — has a problem both in facing reality and in admitting mistakes. As Branko says, there was a time when Serbs and Croats seemed to get along fairly well, indeed intermarrying at a high rate. But could anyone now put Yugoslavia back together? At this rate, we’ll soon be asking the same question about America. Krugman is right about democracy in a sense: Democracy is essentially one big organized act of bullying whereby a larger group bullies a smaller group in order to plunder it with taxes. The “Civil War” proved that whenever a smaller group has finally had enough, and attempts to leave the game, the larger group will resort to anything—even the mass murder of hundreds of thousands and the bombing and burning of entire cities—to get its way. After all, in his first inaugural address Lincoln literally threatened “force,” “invasion,” and “bloodshed” (his exact words) in any state that refused to pay the federal tariff , which had just been more than doubled two days earlier. He followed through with his threat. This is “the kind of nation I believe in,” says Paul Krugman on his blog. I cannot forbear to lengthen an already long paper by adding some remarks about what Paul Krugman calls the "new international economics" (Strategic Trade Policy and the New International Economics, MIT paperback, 1986) and "new trade theory" (in "New Trade Theory and the Less Developed Countries," a paper submitted to the Carlos F. Diaz-Alejandro memorial conference held in Helsinki, August 23-5, 1986). The "new" theory rests on economies of scale. As I told Krugman at Helsinki, I find it a bizarre notion that increasing returns in international trade are new. I developed it at length in my 1953 textbook, based on the 1929 article of John Williams, reprinted in the AEA, "Readings in the Theory of International Trade." Jan Tinbergen developed it in his textbook, International Economic Integration (1954). I recall the joy in Cambridge, Massachusetts, when Kenneth Arrow made increasing returns respectable by formalizing Alfred Marshall's description of long-run decreasing costs historically with his paper on "Learning by Doing," a paper rapidly incorporated into international-trade theory by those who need formal models to understand the intuitively obvious. I confess to some irritation over Krugman's defense of his international-trade theory as new because it offers a well-worn truth in equation form. As was the case with Smith's original observations on specialization and market size, we shall need a tractable analytical framework to make progress on this issue. The two Helpman and Krugman monographs have amply shown that when Smith's ideas are developed within a clear theoretical framework, they contain some surprising implications. They are, I think, outstanding illustrations of why we work to construct useful, explicit theories rather than being content with good rules of thumb. Paul Krugman has been doing a lot of very effective writing attacking non-economists writing about economic matters. Paul is speaking for the whole profession in a very effective way and addressing the most important questions in social science. Robert Lucas, Jr., In: Brian Snowdon and Howard R. Vane. "Transforming macroeconomics: an interview with Robert E. Lucas Jr." Journal of Economic Methodology 5.1 (1998): 115-146. Despite its flaws, Peddling Prosperity has much to recommend it. There is no book written for a lay audience that explains the economics profession with more perception or clarity than this one. I grew to understand how the Chicago School argued, and I can do it myself, but they were lying about how they arrived at their conclusions. I could see that they were obviously lying, but I was just annoyed and shocked that they continued to lie about how they got to the questions that they got to. And then it gradually occurred to me that if this is true, then maybe the whole profession is lying, and that belief has gotten stronger as I have gotten older. People say, "We do econometrics, and that tests our hypotheses." Baloney. We do theory. I was just rereading last night Paul Krugman's famous article where he tries to introduce geographical considerations into economics, and it is a very skillfully done article. It's rhetorically very skillful. I can show you how it works rhetorically, but it is complete nonsense scientifically, not because it is wrong but because it is arbitrary. There are a zillion other ways of formalizing geography in economics that would come to opposite conclusions to those he comes to, and yet he's kind of airily saying that this is a contribution. Then there are a thousand other articles modifying that. It doesn't get anywhere: they modify it and get completely different conclusions. If you change your assumptions, you get different theorems. So the whole exercise, it gradually dawned on me, was complete nonsense, so that's what turned me. But it is unfair and kind of stupid to say that I stopped doing economics. Deirdre N. McCloskey, interview, published in The Changing Face of Economics: Conversations with Cutting Edge Economists (2004) edited by David Colander, Richard P. F. Holt, J. Barkley Rosser Jr.
Paul Krugman is a respected trade theorist. But he does not speak authoritatively on subjects on which he has no expertise. Monetary economics is not his field of expertise. Krugman’s research background does not qualify him as an authority on Milton Friedman’s work. … Friedman’s reputation is intact despite Krugman’s deplorable efforts to denigrate him and his contributions. I am proud of my generation of policy economists. You know their names: Walter Heller, Milton Friedman, John Kenneth Galbraith, Arthur Okun, Herbert Stein, Peter Drucker, and many more. But, as some sage has said, science progresses funeral by funeral. Paul Krugman is the rising star of this century and the next, and the world beats a path to his door. International finance is his thing, but that is only one of the many strings to his fiddle. The World Bank, the IMF, the Bank of Japan, and the Boston Fed all seek to tap his fountain of wisdom and new ideas. If you grew up in the 80s you probably remember Voltron. Although the show often had convoluted plotlines, it would somehow always end with Voltron (a super-powerful robot formed from five mechanical lions) facing off against a monster called a "Robeast". Voltron had plenty of weapons, but he would invariably strike the killing blow with his "Blazing Sword". Eventually the show became kind of routine, but to a four-year-old, it was pure gold. In the econ blogosphere, a similar dynamic has played out over the last few years. Each week a Robeast will show up, bellowing predictions of inflation and/or soaring interest rates. And each week, Paul Krugman...I mean, KrugTron, Defender of the Blogoverse, will strike down the monster with a successful prediction of...low inflation and continued low interest rates. Goldbugs, "Austrians", New Classical economists, and harrumphing conservatives of all stripes have eagerly gone head-to-head with KrugTron in the prediction wars, and have been summarily cloven in twain. I was explaining Nordhaus’s work in a graduate course I was then teaching on the economic theory of natural resources. As a strong believer in economics as a handicraft industry, I mentioned, teasingly, to the class that this remarkable piece of work had been done by an extraordinarily powerful research apparatus, not to be undervalued by advocates of Big Economics: one professor and one undergraduate research assistant. 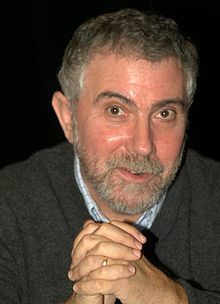 When the class was over, one of the students came shyly up to me and said, “I was the undergraduate research assistant.” It turned out to be Paul Krugman. Teaching can be an unexpected pleasure. Until the emergence of Democrat leader John Kerry, Paul Krugman had virtually become the leader of the opposition in America, an unusual position for an academic economist.